Jubilant members of the Greely High School baseball team celebrate after beating Camden Hills 10-0 in five innings in Saturday's Class B baseball state title game at Standish. The Rangers dropped and damaged the trophy when the pile of players crashed to the ground. Greely first baseman Caleb Normandeau forces out Camden Hills' Ryan Pierce during the Class B state final Saturday at St. Joseph's College in Standish. Greely's Justin Leeman bunts a foul ball, while Auston Nowinski stars in from third during the Class B state final Saturday at St. Joseph's College in Standish. Lehman eventually batted Nowinski home for an RBI. 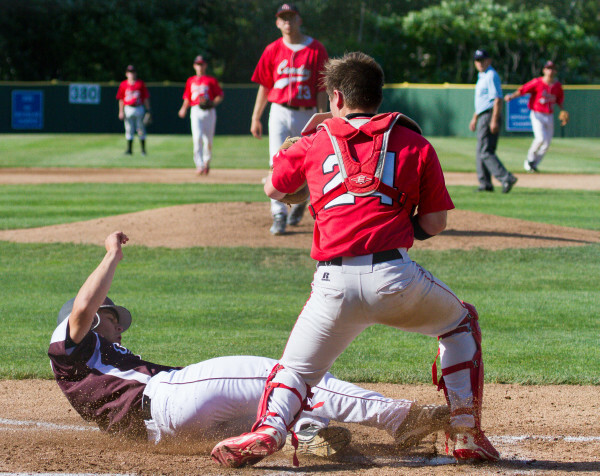 Greely's William Bryant slides safely to home while Kyle Crans fields a late ball during the Class B state final Saturday at St. Joseph's College in Standish. Camden Hills shortstop Benjamin Rollins tags out Greely's Miles Shields during the Class B state final Saturday at St. Joseph's College in Standish. 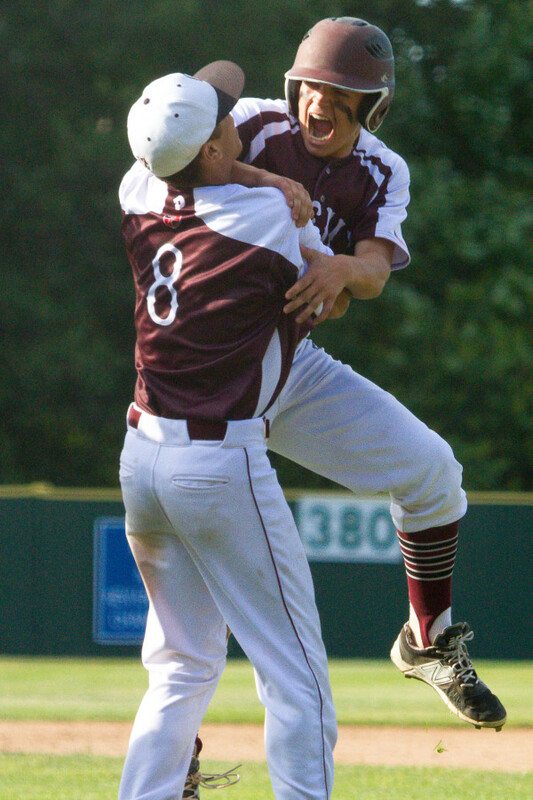 Greely's Gabe Axelson, left, and Calvin Soule celebrate after their 10-0 win over Camden Hills in the Class B baseball state final at St. Joseph's College in Standish. 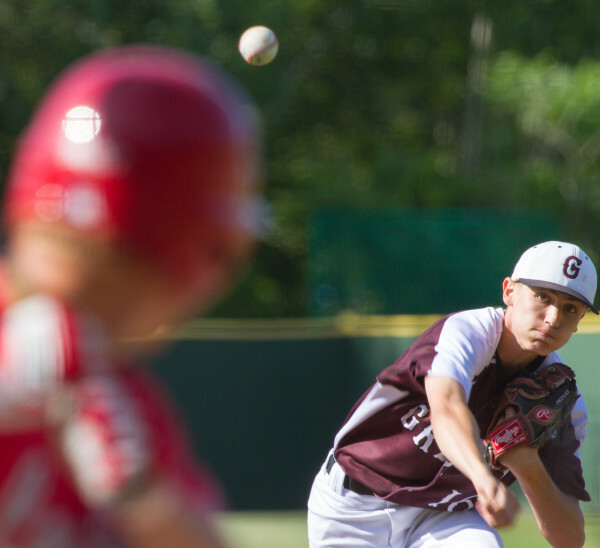 Greely's Ryan Twitchell delivers a pitch to a Camden Hills batter during the Class B state final Saturday at St. Joseph's College in Standish. Twitchel pitched a five-inning no-hitter in the 10-0 win. STANDISH, Maine — The Greely Rangers probably couldn’t have scripted Saturday to go any better. 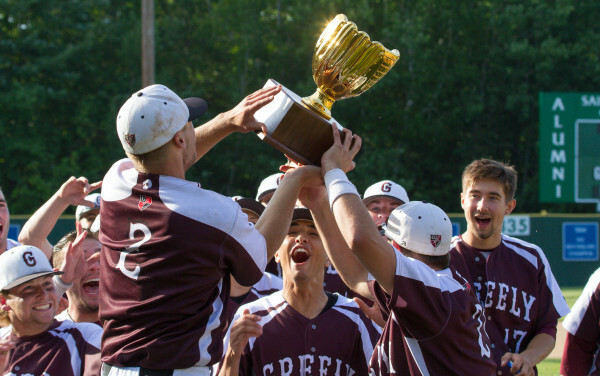 Sophomore Ryan Twitchell fashioned a no-hitter and was backed by a 12-hit onslaught as Greely High of Cumberland Center cruised to a 10-0, five-inning victory over Camden Hills in the Class B baseball state championship game at Saint Joseph College’s Mahaney Diamond. “My first varsity year and then to get to pitch in the state game means a lot,” said Twitchell, who improved to 7-2 by mixing a fastball and a breaking pitch. Coach Derek Soule’s Rangers (15-5), who had stumbled into the postseason with back-to-back losses, capped it off with a flourish to claim their second straight state title. 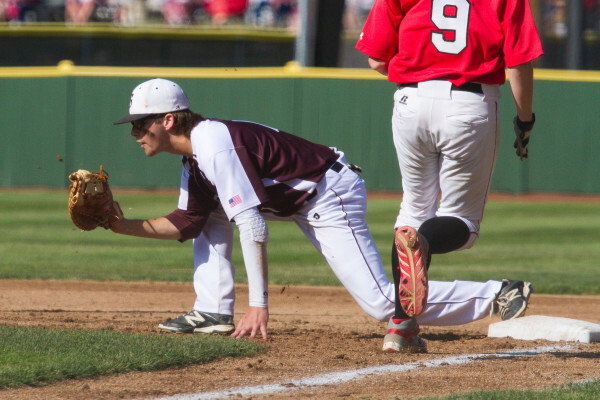 Greely scored six times on six hits in the second inning to take a commanding advantage, then rode Twitchell’s efficient pitching and strong defense while keeping the offense going. Twitchell, a lanky right-hander, did not seem to experience the difficulties with a small strike zone that plagued Windjammers starter Daulton Wickenden. He retired 14 of the 16 batters he faced, working around a leadoff walk and an outfield error in the second inning. Twitchell struck out three in the 59-pitch performance. 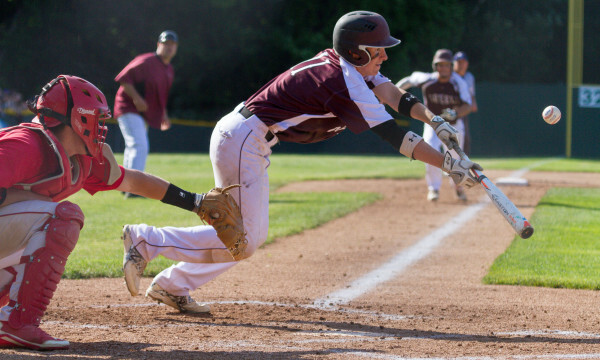 Soule sparked the Greely offense with three singles and two RBIs, senior Will Bryant drove in two runs with a double and a single and Miles Shields posted two singles and two RBIs. Wickenden (7-3) surrendered nine hits and eight runs in 3⅔ innings. His teammates committed two errors behind him. The Windjammers’ only threat came in the second inning. Kyle Crans worked a walk, stole second and took third when the left fielder dropped Michael Wolff’s fly ball. However, Andrew Hall lined into a 4-3 double play and Twitchell induced Ryan Pierce to ground out for the final out. “They’re the champs for a reason. They came in and handed it to us,” said Camden Hills coach Jeff Hart. 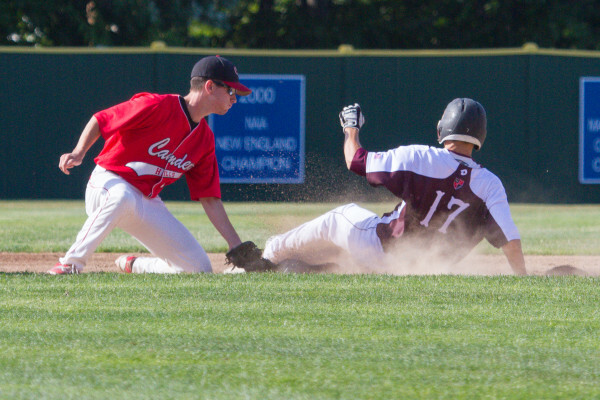 Greely left the bases loaded in the first, but took care of business in the second inning. Matt Pisini was hit by a pitch, advanced on a wild pitch and moved to third on Dylan Fried’s sacrifice bunt. Auston Nowinski pounded an RBI triple over the center fielder’s head and he scored on Justin Leeman’s ground-ball single through the middle. One out later, Shields walked in front of Bryant’s two-run double to right. Soule then delivered a run with a soft single to center field and Chaz Reade carved an opposite-field double down the right-field line that plated the the sixth run. The Rangers made it 8-0 in the third on consecutive, run-scoring singles by Shields and Bryant, before closing it out in the fifth via the 10-run rule. Reliever Dalton Oakes walked Leeman, then Caleb Normandeau singled to right and took second on the throw to third. Shields grounded an RBI single through the left side and Bryant walked, setting up Soule’s game-ending single to left.